This article updates our previous "Magento Go: Custom Tabs on Product Details Pages" post. It describes how to enhance your Magento Go product details pages with custom Ajax tabs. Here you can find new features that we added to our custom Ajax tabs solution. a) Open Magento admin -> Configuration -> Design -> Theme Customization section. b) Then select Java script editor. 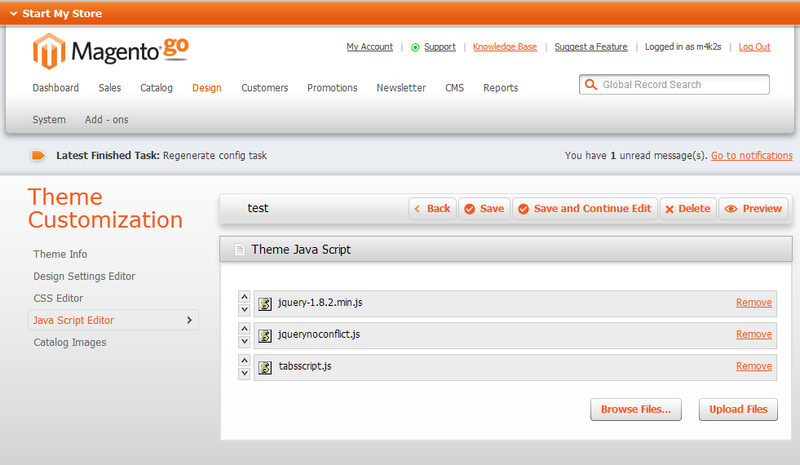 c) Download the jQuery from official website and upload it to Magento Go. and upload it to Magento Go. Now you can add any jQuery plugins. Save it and rename to "tabsscript.js". Next, go to Java script editor and upload this file to Magento Go. f) Click "Save" and enjoy! The method newTabs() can have parameters now. a) You can reorder your tabs. You can enter the desired order of the tabs in  brackets. Note that 0 - a description, 1, and further - product attributes. b) You can group your tabs. You can create as many groups as you want. If you use parameters, you must specify numbers of all attributes you plan to use. Not defined attributes will be not visible. If you will place wrong index it will be just ignored. c) You can remove description from the tabs and use it anywhere else. and uncomment it. Description will appear before the tabs. Of course you can change selector and place it in different place on the page. 3-rd attribute will be removed, since it is not defined in the array. It makes 4 tabs: test1, test2, test3 and test4. Description will be added in each tab. Same for me... did all the right steps as far as i can tell... all three scripts are uploaded in order, set the var tabs = newTabs as suggested, Even made one extra attribute beyond the default ones. anything else i'm missing? Could really use this feature guys. Glad to see the comments are current.. Thank you. I can get it to bring in Description, size and Delivery but how do I bring in other attributed? Hooray! I've managed to fix the syntax error. I just changed the line breaks to have a string on its own line from line 22. Really awesome script!! - Very well done!! There is a syntax error in line 22 of your script. Console says "unterminated string literal" gr += ". Any suggestions very welcome to fix this as we would really like to amend the default tabs. Thanks! This solution takes information from Magento attributes, so make sure that you created them. Hello. This is awesome post, but I can't get it to work. Kindlly help so that I can get it to work? :)I've downloaded, copied and pasted the three java script files: jquery-1.10.1.js, jquerynoconflict.js, tabsscript.js and they are all uploaded in the order instructed. But I don't see any change. How do we add a custom tab? Did we only need to copy and paste the codes, or do we actually need to insert information on the tabsscript.js file? Will this enable jquery plugins to work with each other on MagentoGO? AKA, having a image slider and a scrolling Carousel working on the same site without conflict.